When I was a newlywed GeekGirl, I hated to cook. It was boring and I didn’t like planning out menus or looking for recipes. Those were the pre-Internet days (gasp!) and pre children days. Back then when I got home from school exhausted we went out for meals. However, as I got older I began to enjoy cooking a little bit more and then once the geekette came along I realized that I wanted to make healthy meals for her. I also realized that I wanted to be able to pass on my cooking and baking prowess to my little minion. So puttering in the kitchen became more of a hobby than before. Most of my cooking skills are self taught and are things I have picked up over the years from my mom, mom in law, and Pioneer Woman. I can follow a recipe with the best of them. 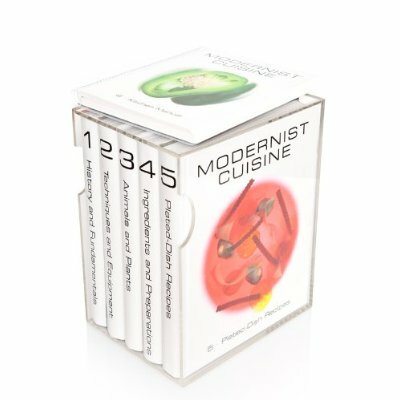 Nathan Myhrvold however takes kitchen experiments to a whole new level of Geek with his book Modernist Cuisine: The Art and Science of Cooking . This former CTO for Microsoft has spent the last four years researching the math, science, and physics involved in cooking everything from steak to boiling water. All that amassed knowledge has been condensed into a 2,400 page tour de force weighing as much as my six year old. While this ginormous doorstop is full of knowledge it is out of reach of most household cooks with a price tag of just at $500. But hey, you could get free shipping which would save some serious scratch since it weighs almost 50 pounds. Kudos to Mr. Myhrvold for his geeky prowess in cooking and expanding the knowledge of humanity. I am sure he has discovered the cause of many cooking idiosyncrasies that we all suffer from but have no idea why they happen. But, while this gargantuan novel of a cooking guide most likely has tons of useful informational nuggets, unless it shows up in my library I won’t be benefiting from Mr. Myhrvold’s wisdom and neither will my fried chicken.